Norwegian Cruise Line pioneered the concept of Freestyle dining, with multiple large restaurants and intimate specialty dining venues. Passengers who prefer standard dining, same time every evening, same table and table mates, can notify the maitre d' upon boarding and arrange to do just that. There are two main dining rooms for traditional-style dining, Aqua, located midship, and Versailles, located aft. Both are lovely, with Versailles looking very much like its namesake (lots of gold and gilt and French Renaissance flourishes), while Aqua is contemporary, calm and cool. There are several tables for two in each restaurant, or you can ask to be seated with others if you prefer. Besides the main dining room, there are a bevvy of alternative venues. Ginza (Deck 7): This free-of-charge restaurant specializing in Asian recipes has a teppanyaki room that only seats 12 at one time, so reservations early in the trip are critical, and a sushi bar with a mechanical "train" that delivers a rotating array of morsels. O' Sheehan's Bar & Grill (Deck 8): If you've cruised on this ship before you could be forgiven for not knowing where you are when you walk up the stairs from the Grand Lobby – the whole space where Blue Lagoon Restaurant and Moderno Churrascaria were has been now given over to a huge O'Sheehan's. The area comprises a small central bar and then all around it, tiered seating overlooking the atrium. It's a space rather than a room, with plenty of windows overlooking the ocean and lots of chunky wooden tables and chairs. Yet despite its size and openness there's a sense of intimacy and character, and it will almost certainly become the pre- and post-dinner meeting place. The only thing missing from this O' Sheehan's is a bowling alley. It serves the typical assortment of simple classic fare that is so popular across the fleet: mac ‘n' cheese, burgers, fries and nachos. Open: 24 hours. The Garden Cafe (Deck 12): The ship's buffet/cafeteria restaurant serving the usual breakfast and lunch fare, casual dinners, and light snacks the rest of the day and night. Omelet and waffle stations are available for breakfast, and at lunchtime, the port side becomes a vegetarian station, with fresh salads, steamed vegetables, and a variety of freshly prepared dishes. La Cucina (Deck 6); a la carte: Italian eatery serving all the usual pasta and pizza favorites. Moderno Churrascaria (Deck 13, midships); $24.95: Moderno Churrascaria, a Brazilian steakhouse, takes up pretty well all the space where the Star Bar once was. The décor is neutral and restrained, and there is lots of space between tables to allow for a private dinner. A small area is given over to the Sugarcane Mojito Bar. Le Bistro (Deck 6); a la carte: Le Bistro is Norwegian's signature French-Mediterranean restaurant, specializing in Continental dining with an atmosphere that's almost as important as the food. Small, dark, intimate, the ambiance is quiet and romantic, making the menu choices taste all that much better. The signature dessert, a fruit and chocolate fondue, is so good that it's a shame to leave it for last. Cagney's Steakhouse (Deck 13); a la carte: Cagney's Steakhouse eatery is located at the top of the ship and replicates a typical high-end steak-and-chop house, with white linens and a clubby feel. 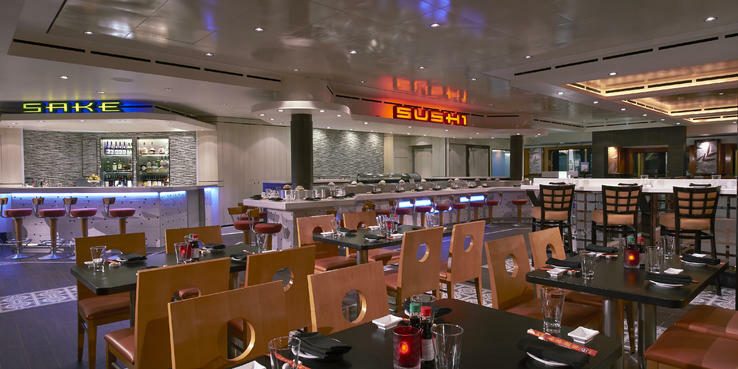 Teppanyaki (Deck 7); $29.95: The ship's Japanese hibachi joint. Room service offers sandwiches, salads, drinks a few hot items and such 24 hours a day, for a $7.95 fee per order; morning coffee and Continental breakfast remain free. Suite and Haven passengers do not pay a room service fee.